Iwaizumi – Elham Morshedzadeh, Ph.D. The purpose of this workshop was to explore possible ways of improving the tourism, economy, food, and craft industry in the area of Iwaizumi. Iwaizumi is located in the North-East of Japan and it is a largely rural area with a relatively low population that it is ageing quickly. Chiba University and ENSCI-Les Ateliers students took part in an intensive field research to learn more about the known and hidden valuable aspects of the local landscape and culture. Iwaizumi is a small town located in the Japanese region of Iwate. As most rural areas, Iwaizumi is experiencing a migration of its younger generations towards the bigger cities. This results in a series of changes that still need to be tackled and assimilated by those who live there. Jobs that before were popular, like farming and craft, are heavily affected by such changes. Furthermore, also the identity of the area has to be re-discovered and presented to the outside. The way we looked at Iwaizumi was by focusing on three main aspects: the Forest, the Food, the Landscape. Obviously, these three areas hugely overlap with each other. That’s because the relations among the natural resources and human activities are many and strictly related to each other. Before we could even think of anything we had to discover this close relationship between the people, their culture, and the territory. The research was extensive, but it is only thanks to the local people that we could access a layer of information otherwise inaccessible. The workshop ended with a presentation to the local people and authorities. 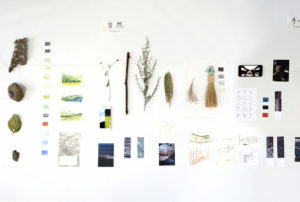 In the presentation, the students proposed a possible art residency program to investigate the identity of Iwaizumi, a system for delivering the Iwaizumi typical food and ingredients and disseminate the culinary culture through the Internet, and a series of maps that highlight the connection of the products manufactured locally with the surrounding landscape and the people living in the area.